BECAUSE I am such a sharp observer and chronicler of our contemporary condition, I have noted of late a preponderant use of the first person by writers, and a commensurate rise in the reading of “I” narratives, preferably those written by me, or for me, or by people who conceivably could be like me if I took time to put myself in a place where I could, in the parlance, “relate.” Relatable or not, “I” is currently getting a lot of play. This is something I, myself personally, have noticed. The man who brought this inward fixation to my attention is Don Quixote. Half a millennium ago, Quixote begins his quest to have his name adjectivally immortalized in the lexicon by reading so many books about chivalry that he creates an alternate reality (I hesitate to say “loses his mind”) in which he wholeheartedly believes he is a knight and that all around him are nobles, knaves and damsels equally subscribed to chivalric code. In short, he invents his entire world, largely ignoring the facts of others’ existence. And so is born the first modern solipsist in Western literature. Fast forward four hundred-plus years, through a few bloody democratic revolutions asserting the rights of the individual to be heard, and you come to the shores of America, where the now-dated joke, “First there was People magazine, then there was Us, and now there is Self,” still applies. It’s just not as funny anymore. Also, the joke refers to narcissism, solipsism’s more famous cousin. A narcissist may be vaguely aware of others’ existence, but he just doesn’t care because he’s busy thinking of himself. A solipsist, by definition, knows others might exist and have actual experiences, he just can’t confirm it intellectually. His world, as perceived through his own subjectivity, is the only thing he can be sure of. As a philosophical stance, it’s largely indefensible as well as perilous, and most of us dismiss it. But what if many of us are unconscious solipsists like Quixote? Or—if the ghost of Cervantes will forgive the comparison—like our President? The unconscious solipsist is a kind of narcissist with philosophic backing for his self-centeredness. The world is my oyster, an oyster cultivated, harvested, cracked open, and slurped down only by me alongside a sea of my own making. I tilt at windmills created in my mind. Maybe we’ve been worried about the wrong self-centered “ism” for the past few decades. The “I” is everywhere. Take a quick survey of recent nonfiction: latter-day New Journalism, memoirs, personal essays, political speeches, blogs, blogs, blogs. In how many cases is the “I” required? In how many cases is the “I” self-indulgent? Is “I” really the subject? Of course “I” is, dummy. Am I guilty of this? Of course I am. To varying degrees, this trend in both fiction and nonfiction has been remarked upon for years. Henry James thought the use of first person in long fiction was “barbaric.” Academics and journalists once frowned on it, in part out of concerns over a perceived loss of objectivity, and in part because it just wasn’t the thing to do. Too limited, too subjective, too egocentric. Bad form. A bit self-congratulatory, don’t you think, old chap? Even Quixote’s story is delivered in the third person. The first person is, however, here to stay, and who can argue with its virtues? Much like the benefits of reading, writing the “I” can foster a rich interior life, a sense of one’s identity, a distinct voice, and a sharpened way of seeing the world. It also can be a way of acknowledging how one’s own subjectivity influences the observation of an event, and so in that way prove to be more honest than the presumed objectivity of something written absent the “I.” Put in psychological terms, the “I,” if used well, can help one avoid projecting one’s own foibles and worldview onto another. 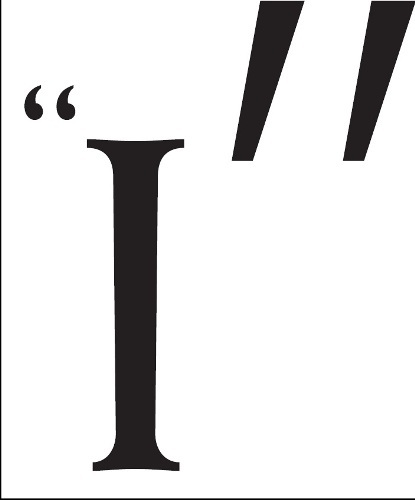 The “I” has potential to check itself before it wrecks itself. But do we often enough write the “I” in that way or—here’s my real question—read it that way? In the admirably democratic ethos of the blogosphere and its venerable grandparents in print, do we write for an audience, or do we write for “I”? And when we read, are we looking for ourselves, a way of framing our own world, or are we open to imagining and perhaps accepting a world outside ours? The solipsist “I” searches for itself online, even if it does so with tongue in cheek (see “Googling Michael Larkin”). The “I” wonders what those imagined others might be seeing there, whether, in fact, those others are looking for “I” at all. They might just be googling themselves, a phrasing which lends the action a sort of perversity that the more New Age-inflected “searching for myself” just doesn’t capture. And even Google, as it fights to control its transformation from proper noun to ubiquitous verb, is a kind of planet onto itself: The world is available to many of us only if we can find it on the first page or two called up by Google. Click, click, and it’s mirrors within mirrors. The implications for such ways of reading are dire. Pick your overly neat divides: red state/blue state, Muslim/Christian, gay/straight, black/white. What hopes for reconciliation do we have if our reading seeks out only confirmation of our own over-explored depths, a consolidation of our position? Though perhaps I use his example unfairly, recall that Quixote came to his delusional position, his imagined world, by intense and highly focused reading. Thus did the world become exactly what he thought it should be, a world we find amusing precisely because Quixote doesn’t. The writer-reader comes to an impasse. This essay, as you have long since guessed, is really about me. When I use the “I” in writing, I try to make it matter to someone else; I don’t always succeed. And though I try to read broadly, too often I gravitate toward reading people who are like me in obvious ways, physically or philosophically. Middle-class, suburban men of WASP or Irish Catholic descent. Leftward-leaning Americans steeped in Judeo-Christian influences. I hear you, brother. Pour me a dram of your insights; it’s a fine steady hand you have there. I’m stretched out retching speechless on the holy stones. So, my challenge to you, dear readers—who are as of this juncture largely constructed as real only in my mind—your task, if you choose to accept it, is to shower Kitchen Sink with emailed reading suggestions, particularly of the non-male, or non-white, or non-middle-class, or non-hetero, or non suburban/exurban, or non-politically-liberal, or non-Christian, or non-American variety… the absolute must-read, life-changing books and magazines and comics and blogs and websites, etc. that will ensure the world, which I believe to be real and knowable beyond the confines of my own mind and experience, is not entirely a work of my imagining engraved in my graven image always looking onto myself forever and ever, amen. Michael Larkin is Michael Larkin. This entry was posted in Culture Mulcher, Paper City and tagged KS16, Michael Larkin, Nicole Neditch. Bookmark the permalink.